So... The last time I had my nails done properly at a salon was when I was 16, right after the big Os. *guilty smile* My nail beds were probably overgrown with cuticles and whatnots. And so, my nails whooped and jumped for a treat at Nailz Treats! Nailz Treats is located on the 4th floor of Far East Plaza. Spanning two stores, the shop caters to both young and mature audiences. On the right, sits the area that is catered to the young. Though the shop is a little obscure from the escalators, all you need is a turn round the corner and a pink, feminine shop greets you. I sank my bottom in one of these big, comfy chairs and let the pampering began! The first thing my manicurist did was to file my nails. This was followed by the grazing of a cuticle pusher tool. For the uninitiated, cuticle refers to 'the layer of non-living, almost invisible skin that 'rides out' on the surface of the nail plate'. Cuticles protect the roots of your nails from bacteria, so it is advisable to leave the pushing back of your cuticles to the pros! After applying 3 coats of black gelish nail polish, my manicurist filed the surface of my nails so that the glitters would adhere better. This is because gelish nail polishes are smooth like milk! Guess what nails I got! TADAHHH! 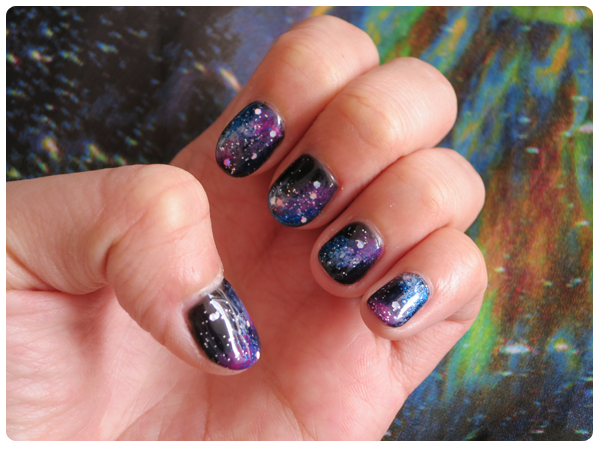 I have got the galaxy in my nails!!! And it was so apt because I was wearing my favourite galaxy skirt that day (That is my skirt in the background.)! 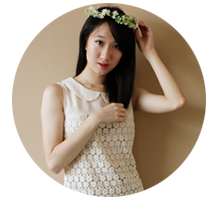 Meet Roselin, the owner of Nailz Treats! She patiently explained gellish nail polish to me because, really, my knowledge of nails just lay in the realm of O.P.I, China Glaze, Essie and Orly. And that's all. Heh. But anyway, I have been enlightened! 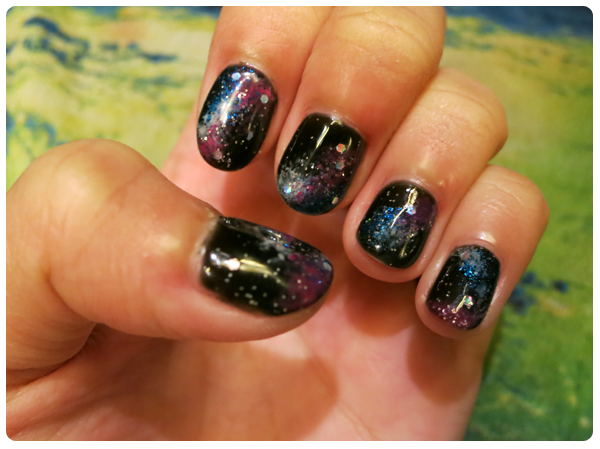 Here's my manicurist, who was extremely meticulous when she dabbed stars and stellar remnants on my nails! And here's another shot of my very gorgeous nails! The entire manicure took slightly more than 1.5 hours. As aforementioned, my manicurist attended to my nails patiently and meticulously. I don't even give such attention to my face, never mind my nails! Working on your nails can invite infections so it is certainly a comfort to know that the tools used the tools are carefully sterilized and manicurists are well-trained. (: Nailz Treats also does not rush through any of the services. Besides gelish, Nailz Treats do other nail enhancements like extensions using gel and acrylic and nail art that is 2D, 3D and 4D! Hands and feet treatments are also available at pocket-friendly prices! Do check the website for more details! And remember to make an appointment first before you head down!